It has been a long while since Oliver Stone was relevant. His last few movies have gone from goofy (W.) to flat (World Trade Center). Even his attempt to be commercial (Savages) lacked the pizzazz of his best efforts. Not that long ago, Stone was dangerous. Natural Born Killers is so subversive, it’s stunning Hollywood made it. Arguably, the anti-war stance of both Platoon and Born on the Fourth of July wouldn’t fly now. While not entirely a return to form, at least Snowden is a fully rounded film that makes clear why the actions of the former NSA contractor are worth our appreciation — regardless of the scorn from both sides of the aisle (Obama wants him extradited and Trump calls for his execution). Stone gives Edward Snowden the hero treatment: a former soldier with conservative tendencies becomes a whistleblower inspired by the liberties the American government takes with civil surveillance (and to a degree, by his lefty girlfriend). In this reading of the events, the CIA’s guilty conscience over failing to prevent 9/11 triggered mass spying on U.S. citizens and cherry-picked foreigners. Often, the legislation that supported the overreach came after the fact, and most authorities chose to look the other way. In my opinion (and I’m the critic here, so it counts), Snowden does a much better job than the Oscar-winning documentary Citizenfour at filling-in audiences on the programmer’s motivations. The doc in question provides the framing of this story: the interview with Laura Poiras, Glenn Greenwald and Ewen MacAskill trigger the flashbacks that become the meat and bones of Snowden. This portrait of Edward Snowden may be too noble to be believable, which will make it easy for those who think he’s a traitor to complain about whitewashing. But so what — most of them think Barack Obama was born in Kenya and a President Trump would be awesome. Given the fact there’s no mystery in the outcome, Stone doesn’t bother to create a fake climax. Instead, he focuses on Snowden’s clinically planned strategy. The film is very good at explaining intelligence services’ mindsets and unveiling morsels like how little the CIA cares about Iraq, as opposed to Chinese hackers (they may have a point here). Filmmaker before activist, Stone makes the whole endeavor flow easily and entertainingly. 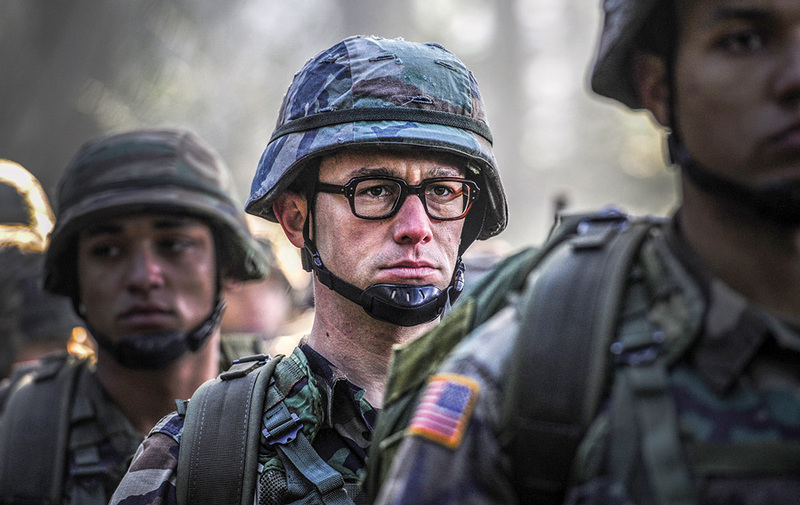 As the titular character, Joseph Gordon-Levitt does a great job as Snowden, from the voice pitch to the deceptive composure Snowden exhibits under pressure. A couple of casting choices are less convincing. Rhys Ifans as the CIA bigwig who recruited Snowden has two strikes against him: he’s British and his early comedic roles make it hard to take him seriously. Nicolas Cage pops up in a smallish role as a cryptographer and mentor. He’s fine, but he’s Nicolas Cage. There’s no way he can disappear into a character. Once again, Snowden’s partner Lindsay Mills gets the short shift, in spite of a spirited performance by Shailene Woodley (Divergent). It’s never clear why Mills sticks with the whistleblower through thick and thin. Perhaps there’s a third movie there.